An excellent story, wonderful characters, great acting, beautifully filmed. This is a fabulous piece of entertainment which enthrals you and in the end, leaves a tear in your eye. Paul Giamatti in the title role proves himself to be a thespian of renown; you can't take your eyes away. Based on the book of the same name by Canadian author Mordecai Richler, the film follows Barney Panofsky through his life and his three marriages. However it is the story of wife number three, Miriam, which makes this an unusual story of true love. He meets her at the wedding with wife #2 and begins to pursue her. Not a full spoiler alert but it is both funny and poignant. She is "the one": a solid marriage, raising children, a normal life. Unfortunately, Barney in a capricious spur of the moment fling (see my blog It seemed like a good idea at the time), destroys the trust with the one true love of his life. Ah, those momentary lapses of judgement that one oh so wishes to be able to take back. [sigh] It is a telling moment later on in the story - Miriam is married to somebody else - when the two of them meet and Miriam asks whether they cannot be friends. Barney who is showing the signs of Alzheimer's gets confused still hoping they'll get back together to which she says, "We had a lovely marriage but now it's over." Once what was so beautiful is now gone. It is so sad. As I said, the story follows Barney through his life and that includes the last scene of his death. I was a little misty eyed bidding a fond farewell to a character very much flawed but who grew on me. According to reports, it has taken 13 years and 5 writers to end up with this $28 million production. Apparently producer Robert Lantos originally worked with the author Mordecai Richler to try and produce a screenplay from this 1997 book. Richler died in 2001 but Lantos continued working with others until he had a script that captured the essence of the novel. The film was shot in Montreal, New York, the Laurentians and Rome; all beautifully done and somehow the Montreal scenes are perfectly punctuated by the music of another Montréalais Leonard Cohen. The director Richard J. Lewis seems unknown but he hails from TV having directed quite a bit of CSI: Crime Scene Investigation. This film will represent a good notch on his belt. Other notables in the film include Dustin Hoffman as Barney's Dad, Minnie Driver as wife number 2 and Rosamund Pike as Miriam, wife #3. If you keep an eye out, you see cameos by David Cronenberg, Atom Egoyan and Paul Gross. I loved Saul Rubinek even though his part was very small. 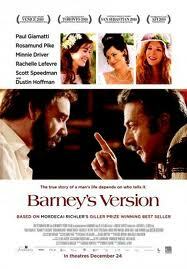 Barney's version is story of the every man who has his moments of greatness and his moments of great wrong. Miriam's voice over in the trailer sums it up perfectly, "Life's real. It's made up of little things. Minutes, hours, naps. Errands, routine and it has to be enough." This is a terrific film. It's real. And it is more than enough. With a magnificent performance by Paul Giamatti, Barney's Version offers much comedy and insight to the complexities of modern romance. Barney's Version is a 2010 Canadian comedy-drama film directed by Richard J. Lewis, based on the novel of the same name by Mordecai Richler. The film was nominated for the Golden Lion at the 67th Venice International Film Festival. Barney's Version is a novel written by Canadian author Mordecai Richler, published by Knopf Canada in 1997.